Dr Ajay Singh has done his B Sc & M Sc in Chemistry from Meerut University. He has also done a PG Diploma in Pulp & Paper Technology. He holds a Ph D in Polymer Chemistry. He has taught at Thapar Group of Institutions & Dolphin Institute. 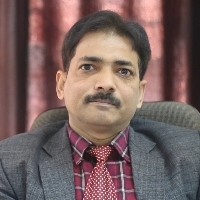 He joined Uttaranchal University in 2008 as Assistant Professor & HOD Chemistry and is now Dean & HOD Chemistry at Uttaranchal College of Applied and Life Sciences. Chemistry is a branch of science that involves the study of the composition, structure and properties of matter. Often known as the central science, it is a creative discipline chiefly concerned with atomic and molecular structure and its change, for instance through chemical reactions. "After completing my B Sc & M Sc in Chemistry, I went on to do a PG Diploma in Pulp & Paper Technology. I also have a Ph D in Polymer Chemistry. I have taught at Thapar Group of Institutions & Dolphin Institute. I joined Uttaranchal University in 2008 as Assistant Professor & HOD Chemistry and am now Dean & HOD Chemistry at Uttaranchal College of Applied and Life Sciences."